Chief Instructor and Chairman of the Traditional Tae Kwon Do Association. 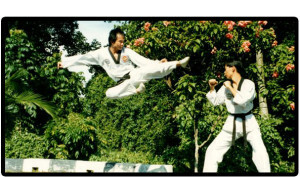 Grandmaster T K Loh practiced under a variety of top Tae Kwon Do grandmasters and masters. Coming from a strong martial arts family background, Grandmaster Loh has acquired considerable knowledge and skills in a variety of martial arts ranging from karate to kung fu as well as lesser known arts like silat and pulculan. Currently Grandmaster T.K. Loh is a Specialist Orthopaedic Physiotherapist. He has a vast amount of experience in sports medicine as well as an acupuncturist (both body and auricular). In the UK, he had trained the R.A.F. in the west country as well as establishing Tae Kwon Do clubs. In 1977, he was the English Champion, followed by the European Champion in 1979 and 1980. He was appointed Academy instructor by Ki Ha Rhee 8th DAN. Grandmaster Loh was then appointed as Chief Instructor and Chief Examiner for the World Tae Kwon Do Federation in Britain. He was also in executive committee for the B.T.C.B. (1982 – 1990). He subsequently tested for his 6th DAN and 7th DAN in Seoul, Korea under Grandmaster Park Hae Man 10th DAN. Grandmaster Loh is also the first in the UK and Ireland to have reached the 7th DAN. He is the only person in Europe to perform a Jumping Back Kick through 6″ of Pine as well as the first in the UK to perform the Aerial Triple Front Kick. Grandmaster Loh was promoted to 8th Dan in July 2000 by Grandmaster Park Hae Man, see July 2000 issue of Taekwondo magazine. In July 2000 on a trip to Korea he was conferred Grandmaster status by Great Grandmaster Um Un Kyu, Vice president of Kukkiwon. Grandmaster Loh 9th Dan, with his experience and knowledge, has maintained the true way of Tae Kwon Do in in the form of the Traditional Tae Kwon Do Association. He has never devalued the journey a student has to make, the hardships, the joy as well as the steadfast attitude the student has to cultivate in favour of commercialism and sport. Coupled with his medical knowledge and Tae Kwon Do expertise, training in the Traditional Tae Kwon Do has been most effective in producing the highest quality of Tae Kwon Do student. The standards of the Traditional Tae Kwon Do Association are high and many have fallen by the wayside and only the best will reach the top.